Do you ever just window shop on Etsy? I sure do! I have lots of favorites and a small wish list of items that I hope to own very soon. There is just something about being able to own something that is one of a kind and hand crafted with quality. There are so many talented artisans selling their crafts and wares on Etsy. Some really amazing gifts can be bought from Etsy sellers. I just love it. One of those very special artisans is Tenaj, owner of CujiCoo. Her family came to the US in February of 2012. Her one of a kind handmade items stand out and are made with love. I received one of her Russian girl pillow dolls as well as a beautiful hand printed linen table runner. Her shipping was fast and the items were packaged with great care. When I opened my package I was greeted with colorful tissue paper and ribbons. The presentation was a very nice surprise indeed. 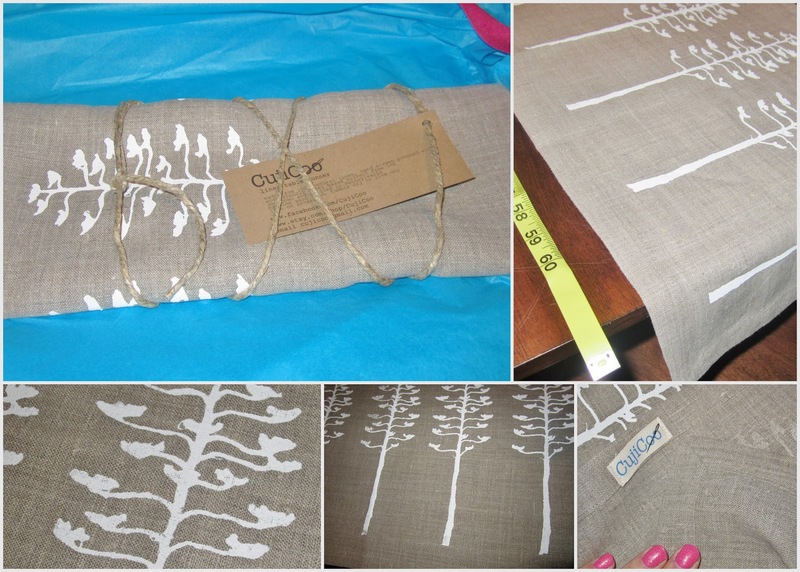 Inside of my packages were my handmade items (pillow and table runner). 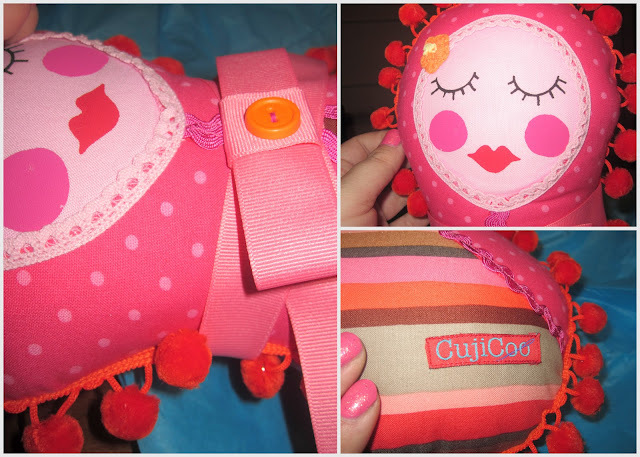 The Russian girl doll pillow was so well made. The seems are tight and everything was sewn so perfectly. I am an avid sewer myself and I must admit that I could not have sewn it so well. 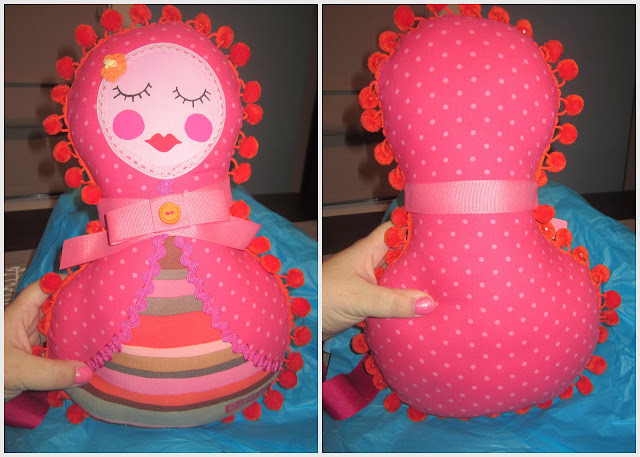 The colors that Tenaj chooses to make these one of a kind pillows are bright and happy colors. I gave the pillow I received to my 8 year old daughter. She loves to snuggle it in bed and it looks so cute in her room. She thinks it's cool because nobody else she knows has a pillow like it. I wasn't sure I'd like it at first but once I held the pillow I became attached, it's adorable. The pillow measures about 14" high and 9" at its widest. The stuffing is a medium firmness, perfect for a little snuggle. The face has been printed with eco-friendly ink. The linen table runner was also expertly turned, the corners are very evenly sewn. I do believe the hem is a blind hem all the way around. The runner is the right length for any standard table. I measured my runner and it was roughly 65-66" long by 14.5" wide. My table is a rectangle that seats 6. The runner I chose was the white sisal tree design on blue gray linen. The thick linen is really sharp looking and it feels silky and luxurious. I probably could have given it a light steam with the iron before I set it on my table, please excuse the light wrinkles. The hand printing is very consistent yet every one has their own unique difference. Each print was hand screen printed with eco-friendly solvent free ink. I keep this on my table every day and it dresses up very nice for the holidays. I don't think I have ever liked a table runner as much as I do this particular one. The other day my 2 year old spilled his milk on it. I was so worried about washing it. No worries though because the table runner washed like a dream, it held up great. All I did was wash on cold and then lay flat to dry. Once dry I gave it a once over on the backside with my iron. I am recommending CujiCoo as a great gift idea for anybody on your list this season. Please see my Best Holiday Gifts Guide 2012 for more ideas. You can also win 1 table runner and/or 1 Russian girl doll pillow ($70 ARV) in my BIG holiday giveaway going on through 12/15. Enter HERE!